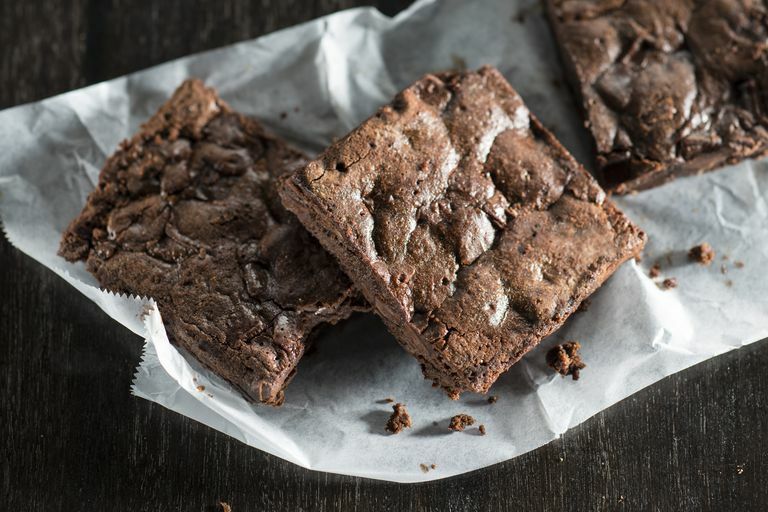 Who would think brownies can be nutritious and delicious? These brownies include flaxseed meal instead of flour, making them healthy, lower in carbohydrates, and gluten-free. And the agave syrup, cocoa powder, and unsweetened chocolate create a rich, chocolatey treat while keeping the brownie naturally sweetened. If you like a more bittersweet brownie, however, you can cut down on the agave syrup. Note that these really take on a brownie texture the day after you make them. And the most interesting part? They taste so amazing you wouldn't even think they have a good amount of fiber and omega-3s, which comes from the flaxseeds. Although this recipe uses the typical 9x13 pan, it makes 32 brownies—so don't be turned off by some of the ingredient amounts. Heat oven to 350 F and coat a 13x9-inch pan with cooking spray. Set aside. In a large bowl, cream the butter until fluffy. Add 1/2 cup agave syrup and beat again until light and fluffy. Beat in the vanilla. Add the eggs, one at a time, beating well after each. Add the cocoa powder and salt and beat well. Add the melted and cooled unsweetened chocolate and beat until fluffy. Add the flaxseed meal, baking powder, cream, water, and up to 1/4 cup additional agave syrup if the batter needs it (some unsweetened chocolate is more bitter than others). Described as "one of the most powerful plant foods on the planet," flaxseed is loaded with health benefits. It is high in both soluble and insoluble fiber, lignans, which have antioxidant qualities, as well as omega-3 essential fatty acids, which have heart-healthy effects. Research has shown that flaxseed may lower blood pressure, and reduce the risk of heart disease, lung disease, and certain cancers—studies suggest that flaxseed may ward off colon, breast, and prostate cancers.